In casting John Phillip Law as the arch criminal Diabolik, motion picture casting approached status as an art form. Spending much of his on-screen time wearing the character’s mask, which only leaves his eyes exposed, Law radiates cynical power with a particularly effective, piercing glare. DANGER: DIABOLIK is yet another European attempt at adapting a popular comic strip into a film property. Lensed by director Mario Bava and producer Dino DeLaurentiis, during the “pop” ’60s, the film is a shade lighter than the long running comic book. This is, however, more than compensated for by the deadpan acting of Law and statuesque Marisa Mell. For the unschooled, Diabolik is an amoral genius who, with his associate Eva Kant, travels the world pulling off risky capers through various schemes and tricks. Haunting the thief’s trail is Inspector Ginko (Michel Piccoli), a determined and competent police official who is still clearly no match for the ruthless and inventive Diabolik. In this feature, DIABOLIK harries the government by first stealing a shipment of funds being transported under disguised police guard. The government, desperate to prevent further pilferings, makes a tentative deal with gangster Ralph Valmont (THUNDERBALL alumni Adolfo Celi). Ginko is loathe to cut a deal with the underworld, but his superiors feel that they can gain the considerable assistance of the underworld in catching Diabolik, by putting pressure on Valmont’s various illegal ventures. When Diabolik absconds with a fabulous emerald necklace, Valmont uses a captive Eva to lure Diabolik aboard his private ‘plane/death trap. Diabolik anticipates trouble and destroys the aircraft, while parachuting to safety with Valmont. In a skirmish with the police, Diabolik evidently kills himself. Returning from the “dead,” Diabolik recovers the emeralds nd, as revenge against the authorities, blows up the national revenue records building. In response, fallen minister Terry-Thomas (who endures a humiliating change of position with each of Diabolik’s new crimes) pleads with the citizens to pay what they _feel_ they actually owe. Needless to say, this is not a well received request. In order to stabilise the economy, the government makes plans to transport their remaining gold store by train. Diabolik, however, is waiting. 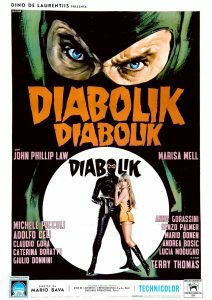 Sparsely aired since its initial release, and only recently available on video (in an extended play print), DIABOLIK plays as an entertaining crime thriller. It’s not strictly true to the source — Diabolik does kill two guards, as well as the gangsters aboard Valmont’s ‘plane, the gangster, and the officers pursuing him after the jewel heist. Still, some of Diabolik’s personality is sterilised in the process. While some of the scenes visibly detract from the pacing of the action sequences, the film still manages a nice pace. My own complaint is the insertion of several comical characters who seem out of place in what could otherwise pass as an action film. Again, the casting of the lead roles is a very definite plus. Morricone’s score is filled with electric guitars and is executed at a frequently frenetic pace. As were many of his scores prior to the ’70s, it’s arranged by his usual collaborator, composer Bruno Nicolai.